Peapod MP3 Player For Infants | OhGizmo! From Calgary-based Peapod comes this full featured MP3 player designed specifically for infants and toddlers who are at least a year old. Instead of a headphone jack the player has a built-in speaker the child can use to safely listen to stories or music and drive mom and dad crazy with endless Raffi. The exact amount of internal memory on the player is not specified but the site claims the player can store 2 hours worth of audio and will run for about 40 hours on a single AA battery probably due in part to the incredibly basic LCD screen. It also has a very simple button layout to make it easy for kids to use but probably more likely to make it easier for their parents to setup. The biggest kid-friendly feature is the rubber overmolded design that allows the player to survive guaranteed falls, throws and of course a good chewing. Let’s see an iPod deal with that kind of abuse. Of course I think the Peapod is just a handy excuse for parents when the RIAA comes knocking since they can claim it was really junior who was responsible for all that torrent traffic. I don’t think their lawyers would convict a toddler right?… Right? The Peapod MP3 player was shown for the first time at the Toy Fair in New York this week and is expected to be available some time in May of this year. 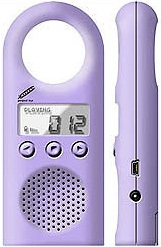 where can I buy a peapod mp3 player? i keep seeing the articles about the peapod but cant find anywhere that sells it. why not?